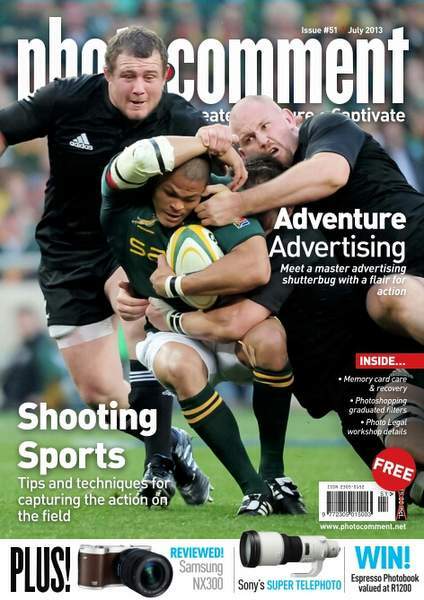 The July 2013 issue of PhotoComment Magazine is out now. 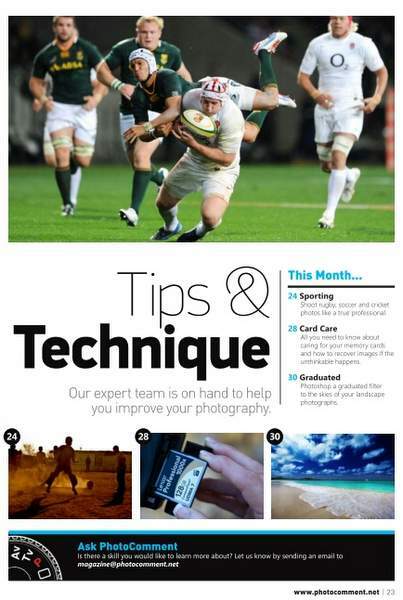 As usual it is packed with tips, tutorials and great images from readers to professionals. You can get the magazine in print through a number of retailers, colleges and clubs as well as online or in app format for Apple and Android powered devices. 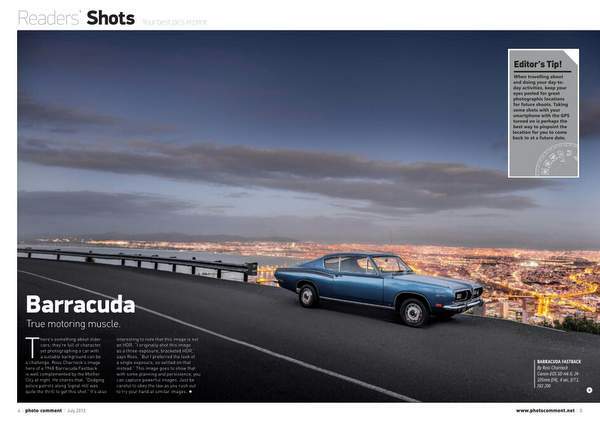 This fantastic cover image was shot by Herman Verwey. In the opening ‘Editor’s Comments’ we tackle the topic of what is most important in photography, the image, or the camera it was shot on. It is not a new topic, but recently as mobile phones and cameras have begun to merge there seems to be a view that a photograph is not a real photograph if it is not shot on a real camera. With SanDisk’s help, we publish three reader’s best images and reward them with a gift from SanDisk each month. If you want to have your images considered for publication, be sure to submit them here. This month’s readers are Ross Charnock, Tracy Kruger and Themba Mbuyisa. We round up some of the news like World Photo Org’s new online magazine, Pentax’s new K-50 and Samsung’s Galaxy NX. There is also some up and coming events listed like gallery openings, workshops etc. The photography industry is blessed with talented new photographers trying to make it and together with Lexar, the ‘Rising Star’ feature is where we share some of these people’s images. 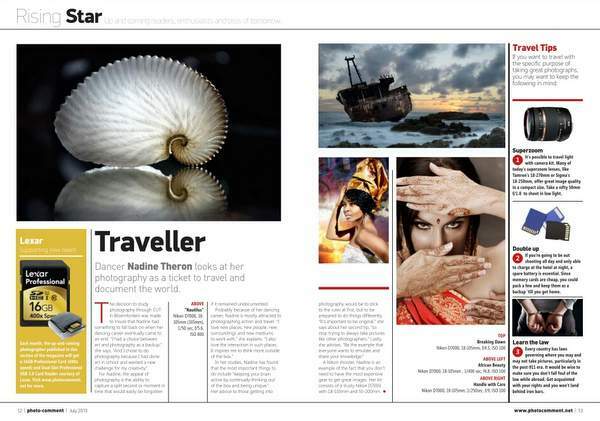 In this issue we look at Nadine Theron’s portfolio. If you are an up and coming photographer and wish to share your work with us, plus get some goodies from Lexar should you be published, then submit your work here. 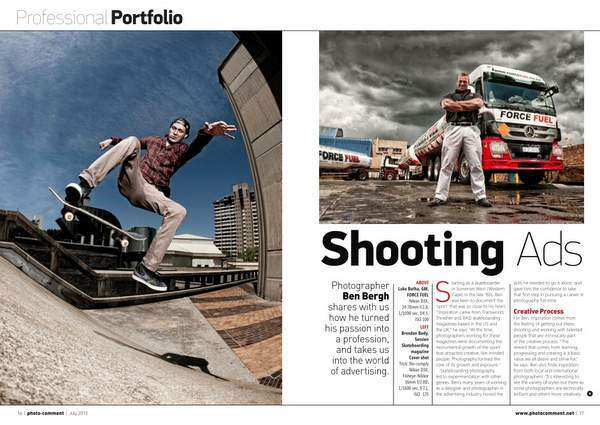 This month we bring you the amazing work of Ben Bergh, an advertising photographer whose interest in photography began with another passion, skateboarding. His action shots are incredible and this portfolio shows the magic that occurs when one merges creativity and technical proficiency. Learn how to shoot sports with Herman Verwey, care for your memory cards and recover them if the need arises, plus Photoshop a graduated filter to a scene. Samsung’s NX300 gets put through it’s paces plus we look at Sony’s 500mm f/4.0 G SSM. For those more inclined to Android devices, there is a review of the Samsung Galaxy Note 8.0. We also review Topaz Labs filters and three mobile apps. Shayne Robinson takes us behind the camera and shares the background story to an image shot by Kevin Sutherland in Alexandra township in Johannesburg.